Today’s post is a collaboration between the bestie, Leah, and I. We’ve been writing together for a long time. I mean, long before real blogs we “blogged” via email and letters. Worthless banter that made us smile and usually laugh. This post falls into both the worthless and laughable category. Hence, you’ll probably really like it :) Especially if you’re a fan of young adult novels like ourselves. After forgoing sleep (like me) or perhaps pulling a smart move like buying Divergent on audio (like Leah), you cannot, can-freakin-not, wait to steal away on an official mom date and see your latest favorite book turn into film. And that leads us to this past Tuesday ... when two young, hipster moms, got away from their needy (but adorable) children to go on a date. Long ago we committed to monthly mom dates and I’m pretty sure our last one was the Catching Fire debut in November. Fail. We planned weeks in advance, lined up childcare (hey-yo fabulous Grandmas! ), stocked up on snacks and filled our big purses with select treats. Trader Joe’s dark chocolate powerberries, homemade granola bars and butter toffee peanuts if you must know. Then Gretchen got sucked into buying popcorn, but scored when the token cinema teen let her get the kid’s pack popcorn complete with mini drink and fruit snacks! The movie of choice: DIVERGENT (adolescent movie). The time: 3:45 pm (geriatric movie time). This gave us our choice of all but 5 seats in the theater. We settled in midway back, center of the row, feet up, snacks in lap. Then we endured approximately 37 previews of various teeny-bopper movies, during which we made fun and ate our treats. Sadly the length of the previews resulted in a diminishing food arsenal. About 20 minutes in the feature film began (sans snacks). The shame! As the screen panned the partial ruins of the city formerly known as Chicago, so began their commentary. Gretchen: Ooo … I love that Amity girl’s vest! They have the best clothes for sure. In response to their first task of being Dauntless (climbing the pillars holding up the train tracks) … Both of us: We’re out! Done. Four/Tobias: It’s a simulation of your worst fears combined. Leah: Yeah, it’s called snakes on a plane. They made a movie about it. Gretchen: I couldn’t do any of this Dauntless stuff. Leah: Yeah… what’s Amity’s initiation? Hoeing? Gretchen: The Amity seem like hippies. We would be them. Leah: I’d like to think I was Dauntless. They have cool clothes… but I’m such a wuss. Gretchen: But you have tattoos! Leah: Where the heck is Edward? Gretchen: I don’t remember him from the book. Leah: He was the one who got stabbed in the eye. Gretchen: Oh yeah…There’s definitely been no eye stabbing yet. Leah: Eric is hot. Didn’t anticipate that. Gretchen: Four is HOT! What’s his name? Gretchen: I just looked him up. He’s British. I bet he needs a green card! Gretchen: Those Dauntless pants are awesome – think we could find something similar at TJ Maxx? Leah: Next mom date is shopping at TJ Maxx, right? Gretchen: I could do that! Maybe I’m partially Dauntless! In reference to the zipline scene. The thought provoking comments continued throughout most of the 2 1/2 hour movie. Basically, it’s your classic, choose-a-faction-based-on-an-aptitude-test-(or clothing preference, if you’reus )-and-then-get-numerous-free-tattoos-and-try-to-not-die kind of story. There are lessons though. Takeaways, if you will. Amnity is the place to be if you like hippy clothes and a happy life. Tattoos are applied by patch, not needle, in the future. Some store needs to start producing “Dauntless Pants” for the general public. Watch for us! People who aren’t allowed to look in mirrors are more beautiful (ex. Ashely Judd). Having a number for a name is strangely arousing. 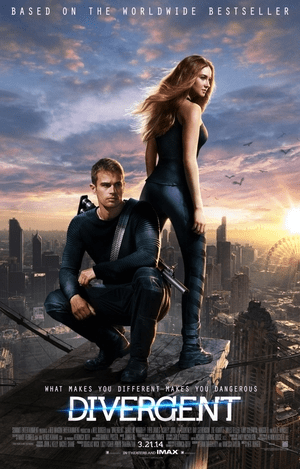 Ready for another mama’s Divergent review – this is a must read! Pacific NW Blogger Meet Up --- It's Today!